It was finally the weekend and my friends Olga & Will invited my bestie Derek and I to the local swap meet. I absolutely LOVE flea markets so I was so excited to finally visit one here in Vegas. It was so beautiful out (what else is new haha) and while looking through my clothes to find what to wear I came across these AWESOME vintage neon orange pants I found at Retro Vegas a few weeks ago. They are my first vintage pants ever because every time I find them, they either don’t fit right or are too tight (thanks booty). These were the perfect fit and didn’t even need alterations! I had to wear them and originally had this idea to wear them with this really cool colorful vintage shirt that had a Pucci kind of print but wanted to keep it simple since I was just going to the swap meet so I just wore a Tommy Bahama silk ivory top. I was feeling tiki so I also wore some vintage wooden gems to match my new vintage wooden basket weaved purse which I also found it at Retro Vegas. 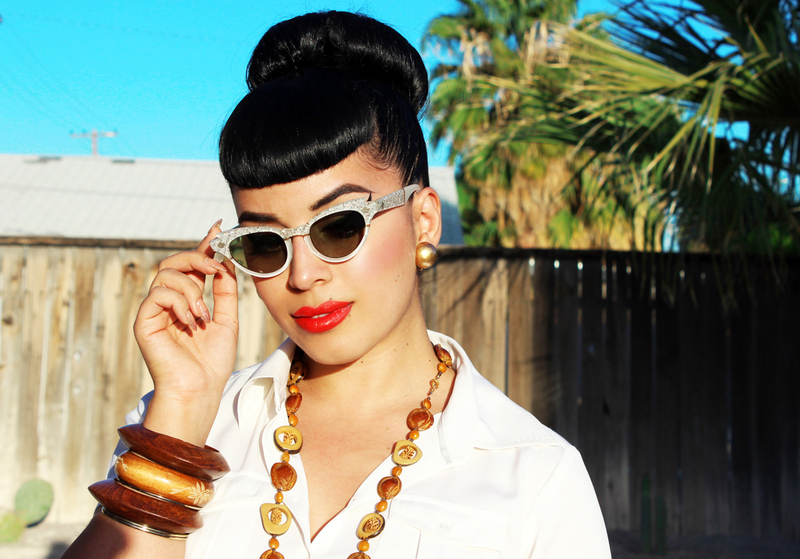 To top off my Island girl themed outfit I wore my cheetah print Louboutins and my new vintage cat eye sunglasses. Perfect outfit for a perfect day and comfortable too! Even better, I was able to finally wear my Shien Forbidden City Lipstick which is the best shade of orange I have ever put on my lips. It matched my pants perfectly. I didn’t find much at the Swap Meet but I did find some cool vintage jewelry and still had loads of fun. I really love that my Vegas friends take me to the best places. They are such a huge part of the reason I have transitioned so well here. See my outfit and my Swap Meet Finds inside! Neon orange is one of my favorite colors. I plan to wear this color a lot this Spring and Summer! These pants are the perfect length for my lil short self haha. They are stretchy and strong too which is great because vintage pants from the 1950s don’t always hold up so well. These are my new favorite vintage sunnies I found on ebay for just $20. My mom tried to steal them from me haha. Love how it matches my Tommy Bahama top. Aren’t they gorgeous? My lipstick is by Shien Cosmetics and is called Forbidden City which is an amazing orange-red color. It is honestly the best shade of orange that I have ever put on my lips. Has a tint of neon too! Can’t wait to wear her other shades! 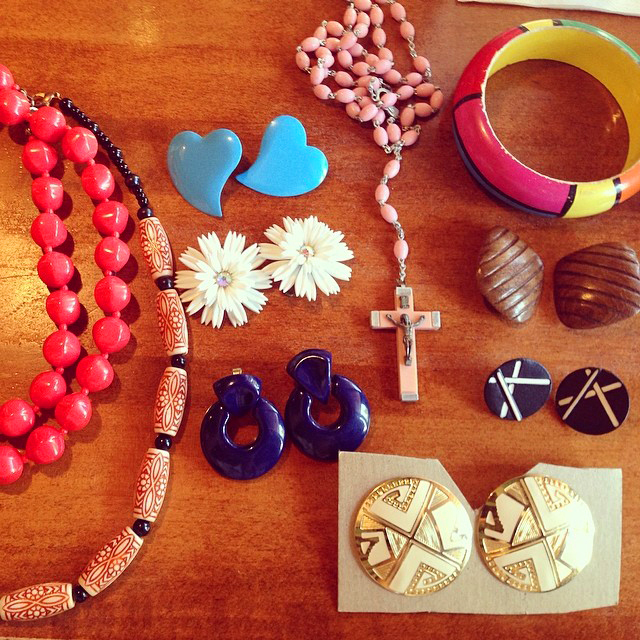 My vintage wooden gems were purchased at Epic Thrift which is a hit or miss at times but I always find something! They match my new vintage basket weave purse I found at Retro Vegas. Very excited I got to wear these babies. They are so comfortable despite looking otherwise! ❤ Some vintage goodies I found at the Swap Meet! Those shoes are to die for omg and the flower earrings are so pretty can’t wait to see how you pair them up with an outfit. You look fab as always the pants are. A si si si!!!! They fit perfectly !!! I love the orange tones of everything. I love those orange pants. Why is it so hard to find vintage pants? I have never been able to. I adore your style! I wish I had the curves (and the courage! :O ) to pull outfits like that off! 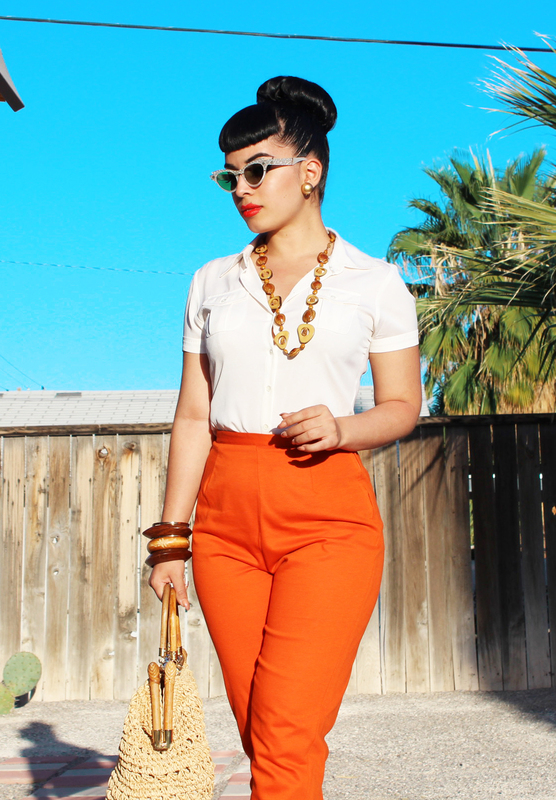 Oh Miss Vintage Valdalizm, how I appreciate your blog and sense of style! Glad you found those pants they accentuate your positives in all the right places! Your sunnies are beautiful and covet worthy as well! I don’t blame your mom for wanting to steal those!!! Derek, your eye is amazing too! Adore the shot of the heels in the plant, like big cats resting in a tree! Wonderful! I love the whole outfit! Some great finds at the swap meet. I LOVE those flower earrings!